Welcome to The Rougelike web page! As you can guess, The Rougelike! is a roguelike game. 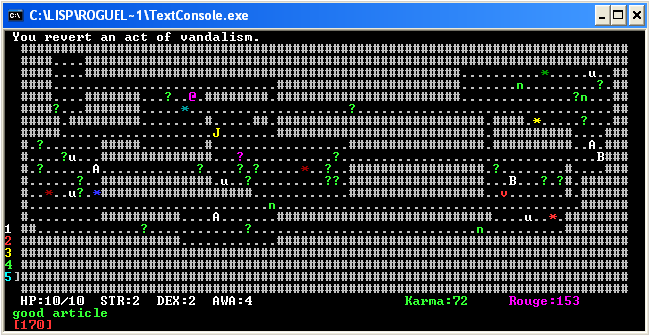 Most of it was written in 7 days, so it's a 7-day roguelike. It was also written in Common Lisp, because it's the best programming language ever. The latest version (1.6) is at http://common-lisp.net/project/lifp/rouge.zip. It includes source and Windows binaries. The latest version for linux (1.61) is at http://common-lisp.net/project/lifp/rouge.tar.gz. It includes source and Linux binaries (which probably won't work for you, knowing my complete n00bness in anything Linux-related). If you want only the source, download http://common-lisp.net/project/lifp/rouge-src.zip. You need CLISP, CFFI, trivial-gray-streams and CL-MD5. The source is platform-independent, but not Lisp-independent (it may compile with SBCL, but this is not tested). Version 1.61, released 16.04.2007 is made specifically to improve Linux compatibility. No other changes are made. The very latest version (1.6) was released on 09.12.2006 and uses a socket-less engine which was first tested on my other RL project, The Sewer Massacre. The game is therefore faster than ever before. Aside from some other minor fixes, everything else is the same. Note that hiscore format is incompatible with the previous version. The previously latest version (1.5) was released on 16.09.2006 includes some new features, such as hi-score, editable keybindings, and better gameplay. It was intended to be the final version, but it was not to be. The previous version (1.0) was produced on 04.05.2006 and is basically what is should've been if I had a bit more time during the contest. There are more monsters, HP regeneration and some small changes. The version before that one was produced on 22.03.2006 and contains improvements in socket code which make the game about 10 times faster. The source code of the game itself was not touched so it was still pretty much the 7-day version. You can get it at http://common-lisp.net/project/lifp/rouge-old.zip. The game takes a satirical approach at Wikipedia. Your character is a "rouge" admin, and you must commit as many outrageous actions as possible before you'll get forced out of Wikipedia. For each such action you'll get Rouge points. You also have Karma points, which are given for good actions and subtracted for bad actions. When you have low karma, people would hate you a lot. noob - very weak and very stupid. If welcomed, becomes user. admin - can delete stuff and ban users (with banhammer).